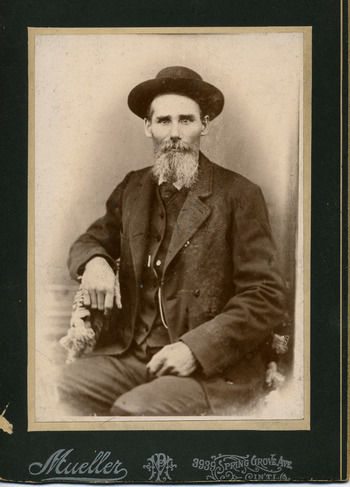 My great grandfather William Meyers ran away from home several times, starting at the age of fourteen, intending to enlist to fight for the Union in the Civil War but each time his parents dragged him home. Finally they gave up and let him enlist at 15. He survived the war and was discharged in the state of Tennessee in 1865.This is his certificate of discharge from the 10th Ohio Cavalry following the general order to demobilize [click to enlarge]. He was eighteen at the time of the discharge and had served since 1862. Here is a picture of William wearing a very small hat. He was my maternal grandmother's father and all the women in his family were members of the Grand Army of the Republic Ladies' Auxiliary.